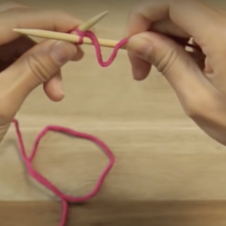 If you're a total beginner and want to learn how to knit, you’ve come to the right place! Most knitting styles see a combination of the two primary stitches: knit and purl. The knit stitch is the foundation stitch and the basis for which you can learn all other knitting stitches. In this tutorial we will talk you through your first knit stitch and how to knit your very first row. Knit stitch is the process of creating knitted fabric using knitting needles to loop and pull together yarn into rows of 'V' shaped knots. 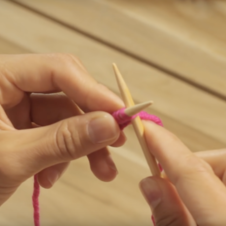 What makes knit stitch different from purl stitch is the manner and direction your right-hand needle is inserted into the stitch on the left-hand needle. Knit stitch is created when the right-hand needle is inserted ‘knitwise’ into the first stitch on the left-hand needle, which means the needle goes underneath in an outward direction, so the right needle travels away from you. Yarn is then looped around the tip of the right needle and pulled back through the stitch. When you see the abbreviation 'k' on a knitting pattern this simply means ‘knit'. Often the letter 'k' will be followed by a number indicating the number of stitches you need to knit. For instance, if the pattern says 'k 1' this means you knit one stitch, 'k 2' would mean knit two stitches, and so on! As you graduate to more complex stitches such as stocking stitch and seed stitch, you will see knitting patterns alternate between knitted stitches and purl stitches. This process creates beautifully textured knitted fabric, perfect for snuggly knitwear and home decor. Before you make your first knit stitch you need to get your hands on some appropriate knitting needles and yarn. A little bird told us single point needles are the best pick if you're starting out teamed with bulky or super bulky yarn - as it’s so much easier to spot mistakes and make corrections when you have nice thick stitches! You will also need to learn how to tie a slip knot and cast on, which you can find in the tutorials below. Getting started. 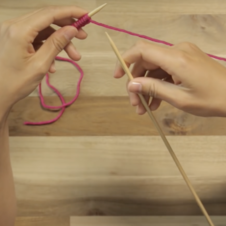 Make a slip knot and cast on the number of stitches you would like to knit in the row. Once you have done this hold the needle with your cast-on stitches in your left hand, the working yarn trailing to the right. We always knit from right to left, so to avoid getting tangled up, keep your ball of yarn off to right-hand side. 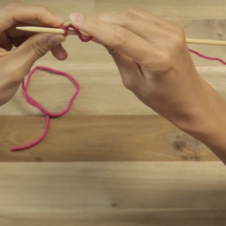 Now you’re ready to make your first knit stitch! Insert the tip of the right needle into the first stitch, pushing up and behind the needle in the left hand. This will mean that your needles will end up crossed, the right-hand needle underneath the left hand needle. Take your yarn. 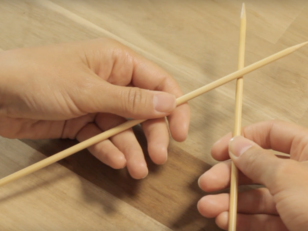 Hold both crossed-needles with the left hand. Take the working yarn with your right hand. Wrap the working yarn anti-clockwise around the right hand needle. Final step. Now comes the tricky, fiddly bit! Use your right hand needle to pull the yarn you have just wrapped around back through the loop. The right hand needle will now cross with the left hand needle in the opposite direction - with the loop. You’re almost there! To complete the knit stitch, slip the left-hand stitch off the left needle. You did it! You will now have one stitch on your right-hand needle, and the remaining ‘un-knitted’ stitches on your left hand needle. Now, why not try knitting the whole row? Pro tip: A simple way to remember is – In, Round, Under, Off. In - insert your needle. Round - wrap your working yarn around. Under - pull your needle back under. Off - slip off your stitch from the left needle. Voila! What can I make with knit stitch? 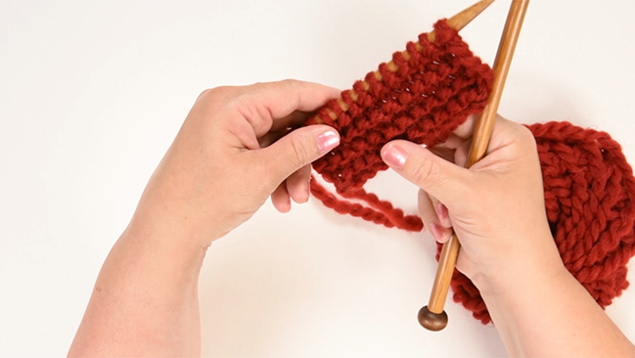 While knit stitch is a great beginner stitch, it’s a firm favorite with seasoned knitters too. If you knit every stitch and every row - you will create what is known as Garter stitch. Notice the signature gorgeous wavy texture! With garter stitch, both sides of the fabric look the same, meaning there’s no ‘wrong’ or ‘right’ side - fabulous if you’re worried about your fabric curling (it won't!). It can also be used to create beautifully classic knitwear - from children’s cardigans, scarves, toys and cushions. If you’re a beginner but want to jazz up your knit stitch opt for variegated yarns which will add a dimension of color to your knitting project!